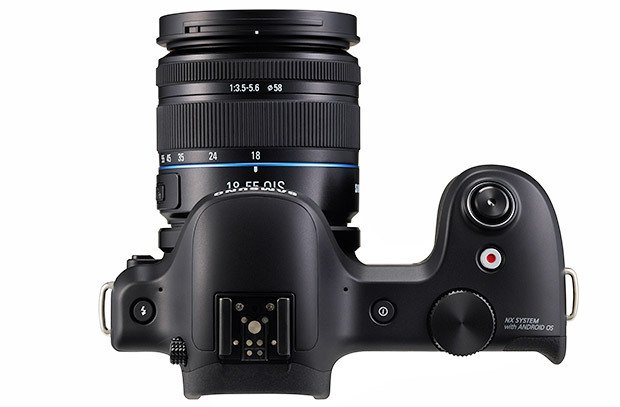 Samsung has thrown down their new Galaxy NX and proudly declared it to be the world’s first mirrorless interchangeable lens camera running the Android operating system. It’s certainly an idea we find interesting: with cameras adding more and more smartphone functions like GPS, photo editing and wi-fi, there’s a compelling argument to take this further and incorporate a fully fledged OS like Android . Such a marriage could prove really handy for the likes of bloggers, road warriors and journalists who would be able to take pictures, edit them, add captions and upload them on to their websites straight from the camera. 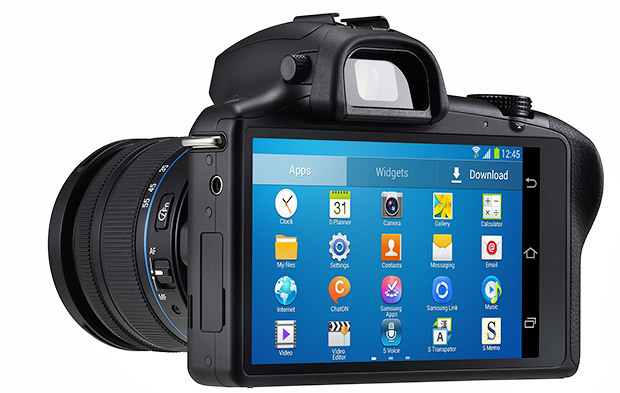 Samsung’s new Galaxy NX takes the form of a 20.3 megapixel, SLR-style mirrorless camera and bolts it together with the Android 4.2 (Jelly Bean) OS, adding 3G, 4G LTE and Wi-Fi connectivity. Around the back is massive 4.8″ HD LCD touchscreen which takes control of all camera functions. We have to say that the lack of physical controls is something of a disappointment, and puts the camera firmly in the ‘point and shoot’ territory. Without any physical controls to quickly change settings, we imagine that the camera is going to be slower to operate than a regular dedicated camera but perhaps this won’t be such a problem for casual shooters. Here’s the press release below. Pricing is yet to be announced. LONDON, UK – June 20, 2013 – Samsung Electronics Co., Ltd. today announced the launch of the GALAXY NX, the first 3G/4G LTE Connected Compact System Camera (CSC). Versatile and easy to use, the GALAXY NX combines cutting edge optical performance with connectivity capabilities and a galaxy of applications based on the Android eco-system, all in one stylish package. The result is a new type of connected device that allows users to turn their experiences into a story that can be instantly shared with anyone they choose, from wherever they might be, in amazing color and outstanding detail. “The GALAXY NX reflects the unique needs of a user who needs to take professional photos and share them immediately in any situation. For those who want to express themselves and the exciting moments that make up their lives quickly, easily and on the go, the GALAXY NX is an ideal choice” said Myoung Sup Han, Senior Vice President and Head of the Digital Imaging Business, Samsung Electronics. With 3G/4G LTE technology, the GALAXY NX allows photographers to stay constantly connected with their world. Promising speedy sharing whether on the move or right at home, the GALAXY NX’s seamless connectivity transcends the current offering to photographers, providing a device which puts the sharing of professional level images at its heart. The GALAXY NX embraces the era of visual communication to provide an outlet for passionate photographers to express their exciting experiences immediately in spectacular quality. The GALAXY NX is equipped to help you capture the scene and mood of every hotspot you visit. Photo Suggest provides location based recommendations of popular photography spots, sourced from a huge library of images taken by fellow photographers across the world. Story Album lets users enjoy timeless memories by displaying special moments on one timeline, reframing and resizing them to create digital photo books that can be viewed and shared on other devices. 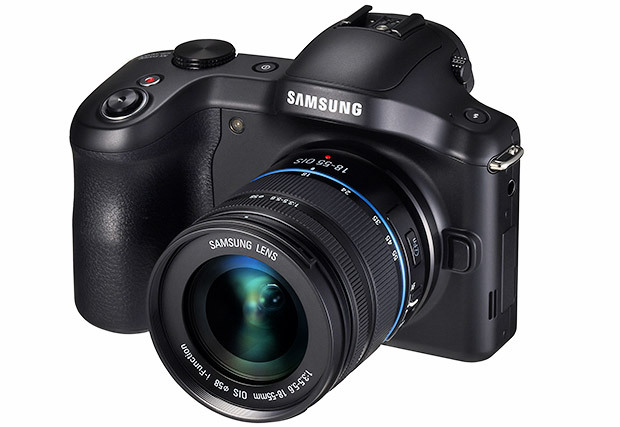 Superior image quality is available whenever and wherever with the GALAXY NX and an array of interchangeable lenses. The 20.3MP APS-C Sensor produces images which are bright and detailed, even in low light conditions, while the DRIMe IV Image Signal Processer delivers the speed and accuracy which today’s photographers demand. Life moves fast and the GALAXY NX makes sure that you don’t miss a moment. Its Advanced Hybrid Auto Focus (AF) System ensures accurate phase and contrast detection for crisp, vibrant shots, while the 1/6000 sec shutter speed and 8.6fps shooting lets you capture the action as it’s happening. 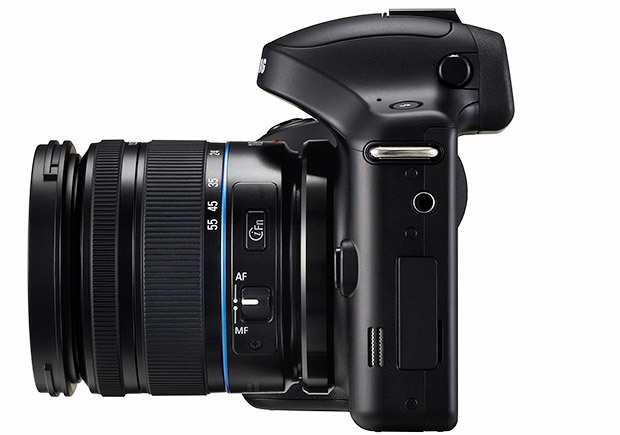 The flexibility offered by the GALAXY NX’s selection of Interchangeable Lenses places creative control firmly in the hands of the photographer, opening up a world of imaging possibilities, whatever the scenario. From compact pancake lenses and an ultra-wide fisheye, to exquisite longer prime and zoom lenses, the extensive range of lenses help change users perspective on their world to create images which are truly special and help them to tell their story in a new way. True 3D Creator also brings an added element of realism to the GALAXY NX results, allowing users to shoot images and movies in 3D with Samsung’s 45mm 2D/3D lens. With Android 4.2 Jelly Bean, the functionality of a smartphone is utilized to improve the photographic experience. Users can choose from an entire universe of Android apps to help personalize their GALAXY NX and do more than just shoot amazing photographs and video, from editing images to adding special effects to staying in touch with friends and family. The GALAXY NX is packed with features which help photographers to take images that embody their passions and express their unique outlook on the scenes they are shooting. More than 30 Smart Modes lets users choose the optimum settings for the environment they are capturing, as well as create fresh, artistic images. ‘Multi Exposure’ merges two different shots together to produce one distinctive image, while ‘Animated Photo’ connects continuous shots of up to five seconds, creating a moving GIF file. For added realism, ‘Sound & Shot’ stores sound and voice together as the picture is taken, so moments are captured exactly as they happened. For added personalization, Camera Studio allows users to easily customize settings with their most frequently used applications or camera modes, making sure their photos are captured exactly as desired every time. For multimedia content and more detailed information, please visit www.samsungmobilepress.com or www.samsung.com/galaxycamera.